I am sick as a dog. Let me rephrase that. I am sick as a cat. My poor cat, Willie-Boo, had the most miserable look about him yesterday. He was just sitting in the middle of the living room, nose almost touching the floor. Very unlike him, usually he’s scampering around, picking fights with Bernie or seeing who can pet him next. He sneezed about 80 times on Saturday, poor thing. I spent the weekend “coming down with something” and the something is here. It’s a cold, and my youngest and I have been sniffling for hours. Thank you, Willie-Boo, for sharing. I have no post for y’all today as I have barely any brain left from all the coughing and sneezing. Bleargh. I suffer from allergies and got really bad headaches this summer but I rarely get sick, as in a cold or anything else, so I am more mad than miserable, because people, I HAVE THINGS TO DO!!! So I’m just going to cheer y’all up with this picture. 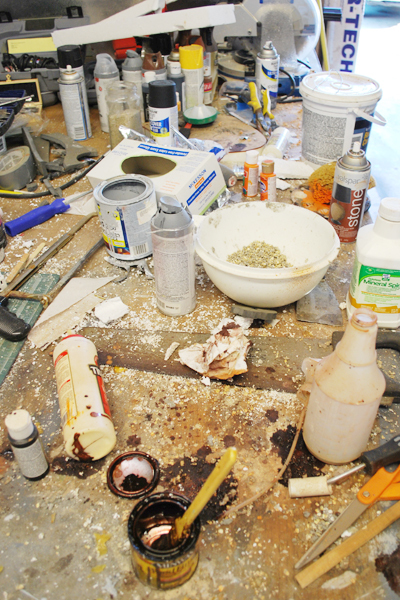 It’s my husband’s work table in the garage. This is what happens when he gets creative. Hope you feel better soon! I also feel like being sick is a waste of time!